Wellington, the national capital, is one of New Zealand's leading financial cities, containing a wealth of large businesses, important companies and financial institutions in and around Wellington's Central Business District (CBD). 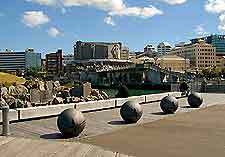 With more than 65,000 people working in the Central Business District (CBD), Wellington is a densely populated city, at the southernmost tip of New Zealand's North Island. The Central Business District (CBD) in Wellington dominates the area and also features a high concentration of shops, restaurants, cafés, hotels and impressive entertainment venues. There are many lively nightclubs in the southern section of Wellington's Central Business District (CBD), and this area, known as 'Te Aro', has become a major entertainment destination, attracting visitor from throughout Wellington and beyond. 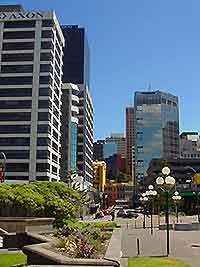 Wellington's Central Business District (CBD) is situated close to Lambton Quay and the main Port Nicholson Harbour, providing good access to ferries. Tourism, retail, hospitality and the spreading campus of Wellington's University of Victoria contribute greatly to Wellington's thriving economy. 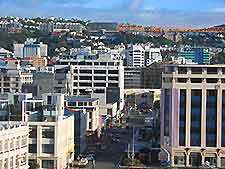 As a result, Wellington has many excellent tourist attractions and facilities in and around the Central Business District (CBD). Currency in Wellington and New Zealand as a whole is decimal, based on dollar and cent denominations. New Zealand dollars (NZD) come in notes to the value of $5, $10, $50 and $100 and there are also 5c, 10c, 20c, 50c, $1 and $2 coins. 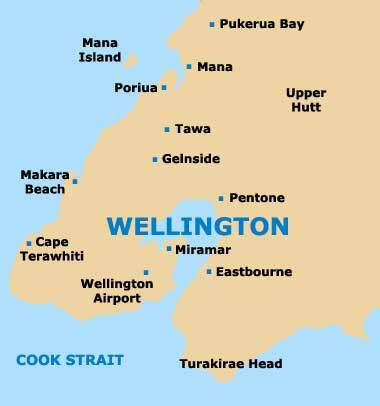 Transactions in Wellington involving 1, 2, 3, 4, 6, 7, 8 or 9 cents are either rounded up or down to the nearest multiple of 5 cents. There is no upper limit on the amount of currency that you are permitted to carry with you in and out of Wellington, and New Zealand dollars can easily be exchanged for any other foreign currency using the current exchange rate. All major credit cards are widely accepted in Wellington and New Zealand, and these credit cards include American Express, Bankcard, MasterCard, Visa and Diners Club. Travellers' Cheques are also happily accepted and most banking branches in the city of Wellington will provide a cash advance against credit cards. Restaurants and cafés around Wellington impose a fairly strict 'no smoking' policy and Wellington's businesses, office spaces and companies are also generally 'non-smoking'. Many locals in Wellington are quite opposed to smoking in public places, therefore it is always a good idea to only smoke in Wellington when people nearby are also smoking, or to ask before starting to smoke. Banking branches in Wellington operate Monday to Friday from 09:00 to 16:30 and many overseas currency exchange outlets are also available at nearby Wellington Airport (WLG). ATM cashpoint machines can be found throughout the city of Wellington and offer an extremely convenient and competitive way to exchange currency in Wellington. Wellington's shops and other businesses generally open weekdays between 09:00 and 17:30. Shops in and around New Zealand's capital city of Wellington also open on Saturdays, from 09:00 to around 12:30 or later, and most shops in Wellington are now open on Sundays, particularly in the heart of Wellington city centre.